My caning abilities have clearly suffered since my time in the studio has diminished! I'll be so glad when we are completely done with the house and I can devote more time to being in the studio! I do however, have to get back up to speed with my caning, and I have to do it soon, as I have another commission to get started on! This one involves a picture cane! Better come out nicer than this name cane! To think, people actually used to buy my picture canes! Journey from lumps of clay to a sentimental sculpture for a dear friend. This is what Liz had to say about the box on August 23rd. Ok, Here's the pictures of what I put in and what I took out. It doesn't look like I took a lot out, but I really did. Everything I took was in small bags, so it doesn't look like a big bunch of stuff. It was fun going through the box. 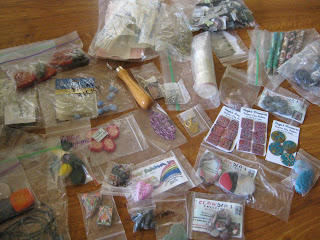 I wish I had a need for buttons or knew someone who sewed or knitted; there are some cool buttons in the box. Putting things in the box was good practice for getting organized in the near future (ah right, roll eyes). I gathered up things that I have been meaning to use as well as things that I use but have too many of. The screw eyes are something I use, but geez, I had to order a gross of each finish. I don't need that many so I hope someone else can put them to good use. Same with the leather cord. I had to buy a whole spool which is more than I can use in a year. I haven't opened up the book I put in for two years, so in it went. BTW, that book is out of print. The 3 Fossil tins are from the dumpster at work. For some strange reason they were unpacking the Fossil watches and throwing away the tins. I couldn't stand to see perfectly good containers going in the trash, so I brought them home with me. Now three years later I decided I really should part with some of them. 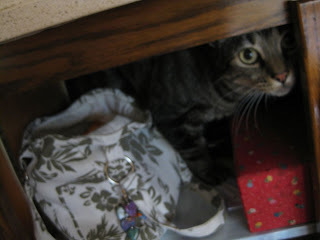 I haven't done a thing with them in the 3 years they have been stored in the linen closet. I hope these pics are going to be ok. I set the camera for the lowest resolution thinking the pics have to be small. Now that I've mailed the box I'm thinking maybe I should have used a slightly higher resolution. Too late...the box is half way to Michigan now. Claudia in Michigan is up next! 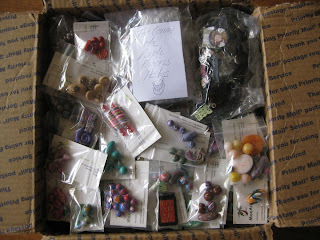 Bj in Illinois had the box on August 17th and this is what she posted on her blog about her time with the box! And a few pressie's too! Liz in Wisconsin is up next! Sorry gals, I've been remiss in posting updates... been kind of busy on the home front. 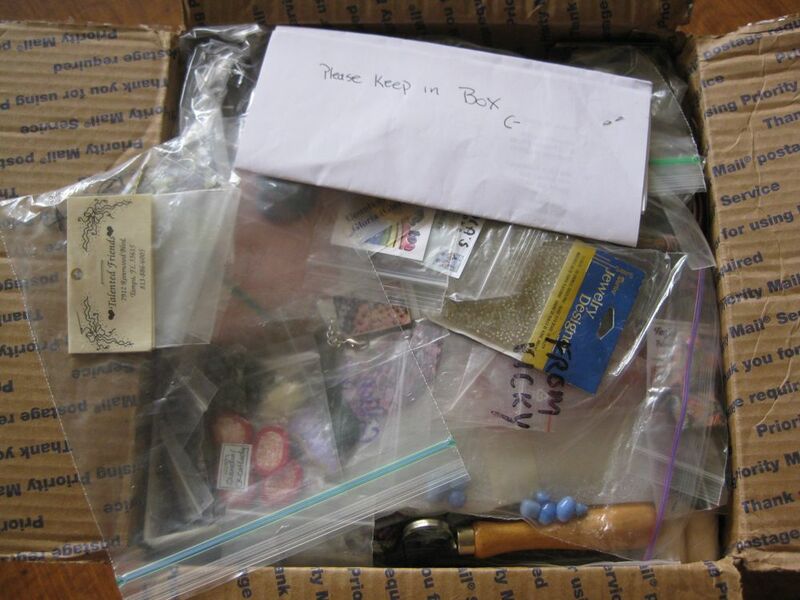 Jackie in Georgia had the box on August 12 and here's a couple pics of what she took and put in! Betty in Illinois is next! Gloria had the box over the weekend and now Jackie has it already! Wow! Moving right along! Fun!! "Box is on it's way to Jackie Mellow. Gosh..I could have saved a few dollars and just walked it to her. Jackie, I was at Mall of Ga. yesterday. We could have met." Pat finally got her pics put up from her time with the swap! "Well, I finally got things back together with my printer and loaded the pictures. I will attach the two. This has been a fun swap, in spite of the quantity, LOL, hope everyone is enjoying the goodies they get. It occurred to me last night that I don't remember putting stickers on the three books I put in the box, so it the next person to receive would please email me I can tell you which three they are and ask you to please put a note on them for me, please. I have lots going on, Chartpak has just hired me to teach their fine arts program for Michael's locally, and samples have to be ready to hang within a couple weeks. This means more hours, YES! when most needed. Here are the two pics. Pat :c)"
It's all about the clay for me. I love working with both materials, whether it's polymer clay or precious metal silver clay. 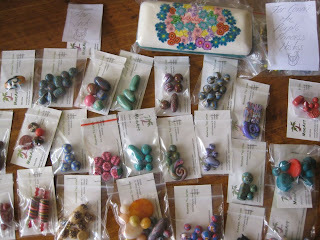 On the polymer clay side, I belong to a wonderful group of polymer artists online at www.polymerclaycentral.com. One thing we all have in common is that after a while, we begin to accumulate a large amount of tools, and various unfinished pieces and parts. To help clear out our clutter and sort of pay it forward to each other, we decided to have a trash to treasure swap. This is our second swap of this kind. First, a person fills a box part way with all their "extras". A list of participants is made and a route of travel for the box is decided based on the listed locations. Each time someone receives the box, they take out what they want to keep. Then, they put in the same amount of items from their "extras" as they took out and send the box to the next person on the list. Each time, photos are taken of what you keep and what you put inside the box. The photos and delivery conformation are posted at our online site for the others to see. This brings me to the point of this blog post. The photos of what I kept and gave are to the right. The top photo shows the contents of the box after I opened it. The second photo shows what items I kept, and the third photo shows what I donated to the box. The Box left the desert! Your humble swap hostess was MIA for a few days there. My apologies, swappers! The box is moving right along without me! 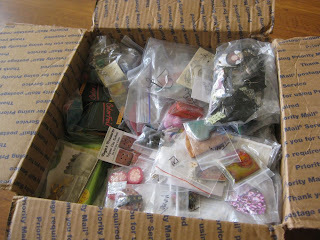 Here's Jodies' story of the T2T swap box! 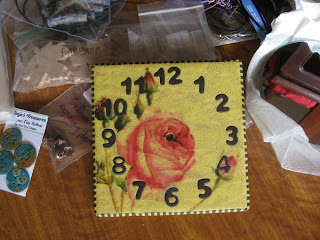 OK...I got the box on [July] 22nd...and sent it out this morning to Janie in AL. T2T_Xof4...took me 4 pic to get it all in! gifties...things getting passed on to others in the Swap! Hope you all enjoy the goodies as much I as enjoyed looking at them all! One thing...please make sure you put your name or a card in with the items you've added! 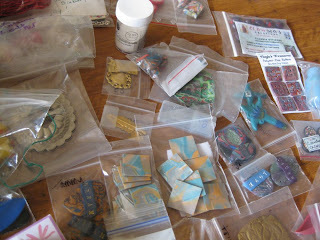 Some of the earrings and beads started to get separated from their cards...and there was no way of knowing who made what!!! The box is headed to Arizona!! This is what Jackie posted about the box's stay at here place! I took a few photos of the T2T box, here they are. The box is crammed full - I mean crammed!! So future swappers might want to think about putting small and flat items in there. Or something. It was hard to get it all back in. The postage amount for the box (large flat rate box) is $15.20 so start saving your pennies. It's going to be on its way to Jodie in Arizona tomorrow! Jodie I am posting it to your PO box so it doesn't get melted on your doorstep. Edited to add: thanks for swapping, everyone. 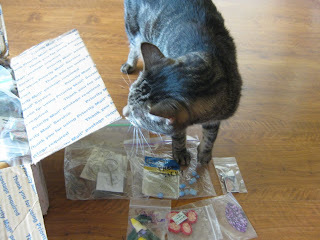 For those behind me - you are going to love Moe's beads! 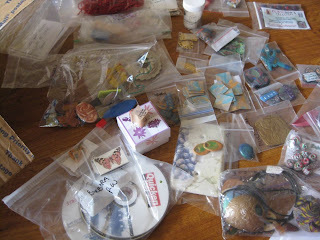 You would have loved Jeanann's things, too, LOL, but I'm afraid some of them are now in MY possession! And Sue C - I now own one of your lizard tails & matching beads, yay. Mary Kay and Rebecca - great tools you guys added. If I forgot anyone forgive me - I'm worn out today. Thanks so much for sharing, Jackie!! Great pictures!! Jodie in Arizona?? You're up!! Constance Pelkey Designs on Facebook! 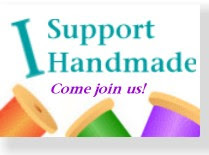 For those of you on my personal Facebook account, you might want to make sure you "like" my Constance Pelkey Designs - http://www.facebook.com/Constance.Pelkey.Designs - page. Because if you are strictly a crafty-type friend, you'll run the risk of being 'unfriended' on my personal account. If you WANT to remain on both accounts I'll gladly keep you, but you have to let me know before August 1st! I plan on doing a LOT more on my business page in upcoming months and needed to streamline FB friends lists! The box - livin' the good life in Hawaii! 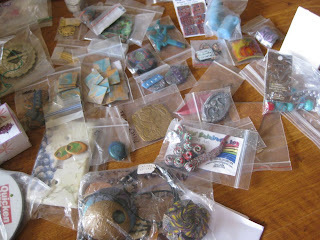 "So, we had a fun swap with all the great people from Polymer Clay Central. Connie, The Purple Princess was our hostess and today I got the box! Heee. 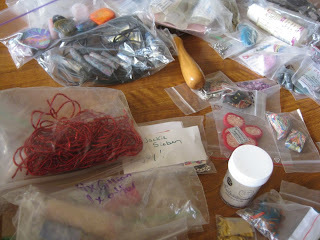 Lots of goodies and prezzies and fun stuff! So, pix! I opened the box. Hmm, this is the end of the box? lotta stuff in this box! box is packed up and almost ready to go but wait!!! what happened to the stuff I have to put in! OIKS! now it's ready to go but... is it??? Thanks so much for sharing the box's journey to the beautiful Hawaiian Isle!! *wink* - the purple princess! Here's the map thus far! Fun, huh? The box is going on VACATION!!! It's headed from Missouri to Hawaii!! Here's what Marykay had to say about her time with the box! ! 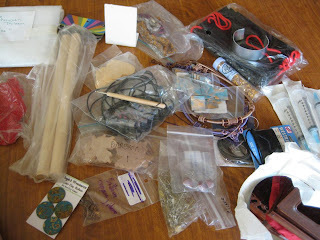 All I put in was a book called Spirit Clay, I think, some tools and a bag of pendants and such. Right now I just feel totally wilted. We have only had 1/4 inch rain in the last month and usually have around 6 inches. Our grass crunches when we walk across it and we are watering our gardens morning and night just to keep them alive until it rains. And the heat index of near 100 for the last several weeks has gotten really, really old! (we did get a break for a couple of days!!) I'll bribe Moe to take pics for both of us! Hopefully, (batting eyes) Moe will take lots of pics as poor Marykay's head is addled from all the heat! Whew! Have a glass of sweet tea for me Marykay! Hope it rains on your gardens soon! Next up? Moe in Hawaii!! click for a bigger pic!